History will be made next week as the Kinsol Trestle is set to be unveiled after an extensive rehabilitation to the structure. Having spanned the Koksilah River for more than 90 years, this “Jewel in the Crown” of the Cowichan Valley has been a vital part of rail travel on Vancouver Island. 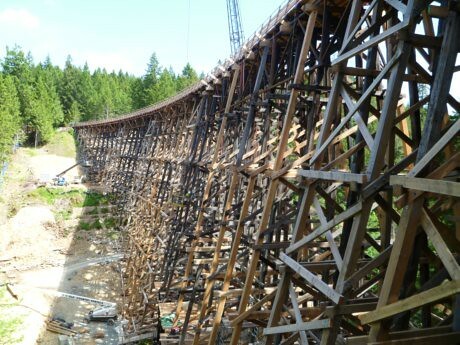 Standing at 44m high and 188m long, the Kinsol Trestle is the largest wooden trestle in all of Canada! “After so much hard work, we are very pleased that the day has finally come to celebrate the completion of the rehabilitation of this magnificent structure,” shared Gerry Giles, Cowichan Valley Regional District (CVRD) Board Chair. “The trestle rehabilitation project was a significant undertaking by the CVRD that would not have been possible without the generous support received from major sponsors, local businesses, community groups and individuals – all of whom share a desire to preserve an important feature of Cowichan’s history,” Giles continued. The Cowichan Valley Trail is part of Vancouver Island’s Trans Canada Trail route. 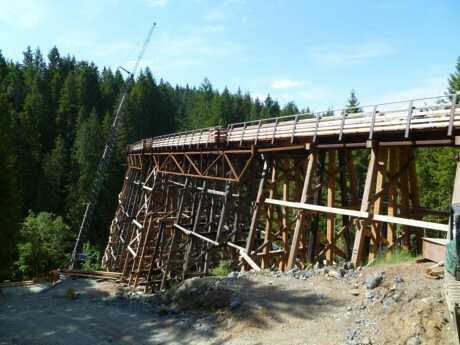 With the addition of a new walkway on top of the structure, the trestle has been transformed into a safe, vital connector on the Cowichan Valley Trail. The community is invited to celebrate this historic grand re-opening along with former Duncan mayor, Michael Coleman. Residents are welcome at this family-friendly event on Thursday, July 28th at 11:00 a.m. Refreshments, entertainment and information booths will be on hand. Those wishing to be a part of the grand opening celebration can take a quick shuttle from the Shawnigan Lake Community Centre (2804 Shawnigan Lake Road) starting at 10 a.m. Make sure you bring sturdy shoes as the walk from the drop-off spot to the trestle site is about 15 minutes. For more information, visit the Cowichan Valley Regional District online. This is so exciting! I was planning to bike up island this weekend, maybe I will take this route! this is quite exciting news!! !